This is a high-performance upgrade for any TGB scooter sold in the USA in the 50cc range. 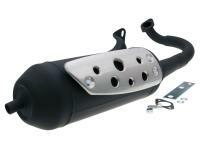 Easily replace your stock muffler with this Tecnigas TGB Franco Morini enhanced upgrade. High-torque exhaust in a subtle design. Provides considerably more top speed. For those who want a new silencer and want more power, but do not want to ride with a small and particularly sporty sounding exhaust on their scooter right here. Very good torque curve and excellent performance on 50cc and 70cc sport cylinders. Fits on TGB models, Italjet Formula and other vehicles with air-cooled Morini engine.